Turn your existing Yahoo! 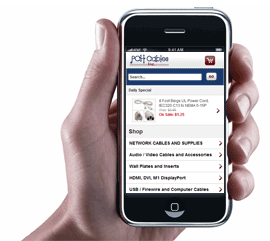 Store into a mobile phone-compatible shopping site with no extra steps on your part. Unbound Commerce offers a turn-key, completely automatic way to take your existing Yahoo! Store catalog and generate a mobile phone compatible site that comes up automatically whenever someone visits your site using a mobile phone device. All you need is to sign up with Unbound Commerce, we do the implementation and you are ready to go. Place your order here first and we will provide you with a coupon you can use with Unbound to waive the setup fee with them. Please check with Unbound Commerce regarding the capabilities and design of the mobile site implementation. Y-Times is only responsible for integrating Unbound's system into Yahoo Stores. A pleasure to work with. Our mobile site was up and running a few days after the order was placed with Y-Times. As always, fantastic job and quick implementation!! Thank you Istvan!! Istvan (of Ytimes) is highly proficient and with good scope. From big picture to finite detail, from both sides of the project user and developer. Trust YTimes to make your move to Unbound Commerce an easy one. Simply sign up at their website. Get connected to insider Yahoo! Store advice, tips & strategies. © 2001-2019 Y - Times Publications, L.L.C., Kihei, HI, USA. Y - Times Publications, L.L.C. and its products are not associated with or endorsed by Yahoo! Inc. Yahoo!, and Yahoo! Store are registered trademarks of Yahoo! Inc. Click here for more copyright information. Copyright © 2001-2019 Y-Times Publications, LLC. All Rights Reserved.